You always want to make sure that your logo is memorable. A great way to do this is to get a logo wall sign to go into your lobby or reception area. Logo repetition is key to making sure that a potential client remembers your company so you want to use the same logo for any exterior signage, interior signage, and all of your online marketing. Even if your logo isn’t always in the same format, using different variations while using the same logo colors still creates an impact. 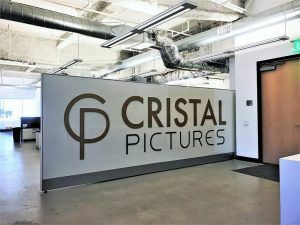 A lot of companies will have the lobby sign on a blank wall in the lobby, hallway, or above the reception desk, but Cristal Pictures wanted to make a bigger impression. They happened to have a blank wall partition in their office and they decided to use all of the space for their logo. This meant that the sign was going to be a little over 14 1/2″ wide and 5′ tall. They already had an established logo that we decided to make from dimensional acrylic letters. The existing wall wasn’t completely smooth and blank so we decided to put the letters onto a backer that was the same size as the wall as opposed to mounting them individually directly onto the wall. When making an acrylic backer lobby sign, we attach all of the components onto the backer first at the shop and install the sign as one piece at the location. The letters and logo are all 1/4″ thick acrylic. The logo and “CRISTAL” were painted gold, and “PICTURES” was just cut from black acrylic. While their logo colors were already established, we still needed to decide on the background. During the proofing process, we showed them options with a brushed finish and a white finish. After comparing the two different renderings, they decided to go with the white finish. Since the proportions of the logo and the actual wall were a little off, we decided to put the logo at the top and lay aluminum with vinyl to fill in the bottom section. In earlier proofs, we were going to use black vinyl but in the end, we decided to go with silver since it works better with the logo on a white background. The sign looks great in the office and it is sure to make a big impression or anyone that visits the office. Check out our website gallery for more acrylic backer lobby signs we’ve made that have acrylic dimensional letters.